Surviving Aberfan: the People’s Story was written in a matter of weeks and proved the most affecting project I’ve ever worked on. Researching and writing the narrative and transcribing 27 interviews with Aberfan survivors (children and adults), rescuers and bereaved parents meant that I was often in tears and I still can’t read some passages without crying. The people Steve persuaded – with some difficulty – to appear on camera and who ‘appear’ more extensively in the book are extraordinary: strong, dignified, occasionally very funny, always inspirational. They suffered unimaginable trauma and loss yet have come through. Their warm Welsh voices and their belief in a better future shine through the pain: the story is one of terrible tragedy and official neglect and betrayal, yet it ends on a forward-looking and positive note because of the people they are. This book was a first in so many respects: the shortest ever time I’ve ever had to write a book – about 5 weeks; my first foray into self-publishing (no commercial publisher was prepared to meet the punishing deadline); the first self-published book to carry the BBC logo; and the first of my books to be formally presented to the Prince of Wales! It’s a modest book, modestly produced but it contains the most amazing stories of survival and stoicism. 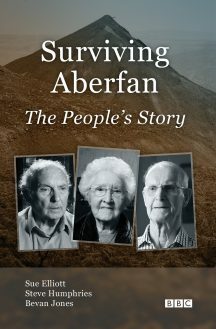 You can buy Surviving Aberfan: the People’s Story on Amazon here.